In the study of ways to determine the position of and manipulate magnetic nanoparticles – a capability that would benefit a wide range of applications – there's good news and bad: While a magnetic gradient force field (a magnetic field that varies with respect to position) can accomplish this, it is limited in its ability to affect most paramagnetic materials – that is, materials that respond to magnetic fields, but do not retain magnetic properties when those fields are removed – the exception being sufficiently small magnetic nanoparticles, which can behave like paramagnets at room temperature due to thermal agitation (an effect known as superparamagnetism). That being said, the ability to use a magnetic gradient force field to precisely control paramagnetic molecules in solutions has remained elusive. Recently, however, scientists at University of Strasbourg, France have proposed that this limitation can be addressed by using miniaturized ferromagnetic electrodes to create powerful localized force fields that can be tuned by an external magnetic field. 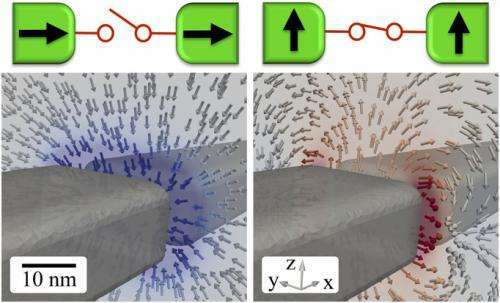 The researchers then illustrated this concept by immersing a metallic nickel (Ni) nanobridge electrode in a solution containing paramagnetic molecules and controlling the electrode's magnetization direction with an external magnetic field. In so doing, the scientists created a conductive molecular-sized switching system that they say is the chemical equivalent of a spintronics (that is, spin transport electronics) solid-state spin valve two-terminal device. Prof. Bernard Doudin discussed the paper that he, Researcher Petru Lunca Popa and their co-authors published in Proceedings of the National Academy of Sciences. "Our concept of extending the spintronics spin valve to magnetic electrodes in solution using magnetic control of their chemical environment totally novel, and essentially results from an unexpected discovery," Doudin tells Phys.org. "We were looking for spin valve effects in a metallic contriction," a type of nanowire, "and found that changing the chemistry was producing a large change of resistance associated with a change of applied magnetic field." The challenge, Doudin says, was to devise an experimental controlled microfluidic setup that allowed a continuous and reversible change of the sample's chemical environment. Doudin points out that conducting micromagnetic simulations was essential to confirming the creation of a chemical equivalent of a solid-state spin valve device. "This provided confidence in a model of magnetic forces, backed by several reported experiments in the field of electrochemistry," he explains, adding that an unexpected result of these simulations was the occurrence in transverse magnetic fields of repulsive forces. "From a micromagnetic point of view this was a bit counterintuitive, and reinforced our gradient force field concept." "A key innovation is our model of the influence of magnetic forces on chemistry, since it goes against the general belief that magnetic gradient force should not have any noticeable effect," Doudin adds. "In fact, work by J. Michael D. Coey1 – our paper's editor – is among a small number of published papers showing such effects." The paper suggests that the magnetic field gradient can become a dominant influencing factor on chemical reactions at the nanoscale. "We devised a system where any equilibrium change can result in a large change in a physical property, such as conduction of the nickel nanobridge," Doudin explains, "and designed a magnetic circuit where this force is maximal. " That said, Doudin points out that while their experiment was originally designed with nickel as part of their evaluation of spin valve effects in metals. "However, our paper adopted a more expansive approach based on our goal of asserting that what is observed with nickel can be more generally applied." Their findings also suggest that the reaction yields or the chemical equilibrium can also be influenced by the gradient of the magnetic field. Specifically, the single reversible reaction step, yield is either metallic (Ni) or ionic (Ni++). "We use the phrasing of yield for comparison with the literature on chemical equilibrium modified by magnetic fields rather than gradients, where the equilibrium changes are small, and relate to intermediate products," Doudin says. "The largest impact, in these cases, is usually the reactions yields of some final product." Regarding the implications of extending magnetophoresis to magnetic forces on paramagnetic molecules in solution, Doudin tells Phys.org that performing magnetophoresis on single molecules will always be limited by the dominant Brownian motion of molecules. "We can, however, significantly modify the average residency time of molecular species at a given position," he adds, "and thereby impact chemistry." This, in turn, may lead to the creation of new types of spin-sensitive devices. "These might include single-spin detection by electrical means, or realize stable chemical structures of highly sensitive to local magnetic fields," Doudin illustrates. "As mentioned in our conclusions, supramolecular architectures can be sensitive to the magnetic forces effects, and their role in a chemical reaction, or as intermediate bridging element in a biochemistry reaction process, could be modified under local magnetic forces." Another possibility is the development of a metallic nanobridge exhibiting electrical properties tunable through a change of magnetic orientations of the electrodes. "In our paper, a change of electrode magnetization is induced by an external field," Doudin explains. "One can imagine other ways to control the magnetization, such as an electric current or a substrate deformation." (The latter is a current trend in spintronics, he notes, where spin-dependent devices should be controlled by means other than an external magnetic field.) "As the conductance is highly sensitive to paramagnetic ions, one can imagine detecting ions by electrical means." In their paper, the scientist also proposed a tabletop tool and methodology for influencing chemical reactions. "We can search for other reactions implying paramagnetic species – for example, radical polymerization – and test this happening or not between magnetic electrodes," Doudin points out. "One can also imagine creating patterned magnetic substrates, where surface chemical reactions will be controlled by their magnetic orientation, thereby realizing tunable chemically-active substrates." He adds that their tabletop tool refers to the laboratory equipment required by their approach relative to that used in spin chemistry, where usually very large magnetic fields are needed to impact significantly the chemistry. "With the magnetic field values we use, a simple tabletop device is enough to create such fields." 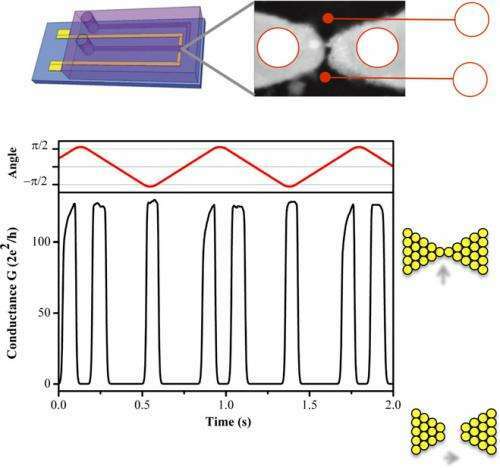 Moving forward, says Doudin, the scientists plan to investigate single-spin detection using similar metallic nanobridges, and to search for other chemical reactions that can be modified by our magnetic circuit – in particular, control of supramolecular architectures. "Most molecular architectures seen in nature are based on rather weak and dynamic chemical bonds. Therefore," he concludes, "the study of the equilibrium and stability of supramolecular architectures under magnetic field gradients, which can have important implications in biochemistry processes, might benefit from our research." New theory predicts magnets may act as wireless cooling agents.